Located in Canyonlands National Park. I was the first to arrive at 5:30 am, and by 7:00 am there were about 20 photographers and 30 more on lookers to witness an amazing sunrise at Mesa Arch. If you look closely past the arch and just below the sun beams, you will see three interesting rock formations, Washboard Women and to her right is Monster Tower, and behind both of them is Airport Tower. 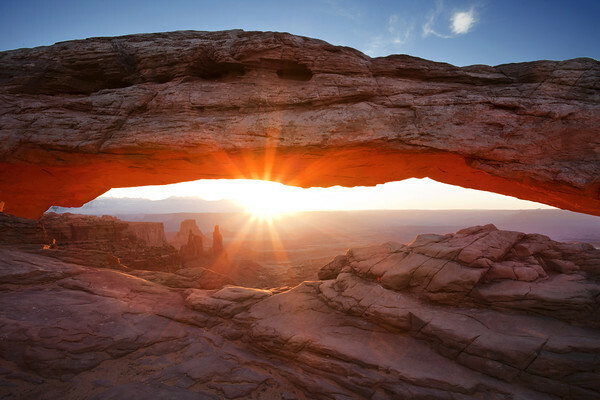 Canyonlands is the largest National Park in Utah, and its diversity staggers the imagination. The easiest way to see the park is with a visit to the Island in the Sky district, only 32 miles (51.5 km) from Moab. The Island in the Sky offers many pullouts with spectacular views along the paved scenic drive. Hiking trails and four-wheel-drive roads access back country areas for day or overnight trips. The Island in the Sky sits atop a massive 1500 foot mesa, quite literally an Island in the Sky. Twenty miles (32.2 km) of paved roads lead to many of the most spectacular views in Canyon Country. From these lofty viewpoints visitors can often see over 100 miles (161 km) in any given direction, resulting in panoramic views that encompass thousands of square miles of canyon country. Take a short day-hike or spend a relaxing late afternoon enjoying the sunset. Whether you have a few hours to spend or a few days, the Island in the Sky provides an unforgettable Canyon Country experience for the entire family.